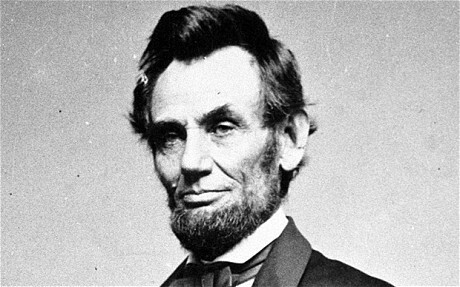 If you are an American citizen then you have been brought up on the Thanksgiving story and subsequent holiday. However, for the rest of the word, we really only get an occasional glimpse of the thanksgiving 'machine' through imported American films and television. So, just what is thanksgiving - and is it really bigger than Christmas? Thanksgiving, or Thanksgiving Day, is a holiday celebrated in the United States on the fourth Thursday in November. 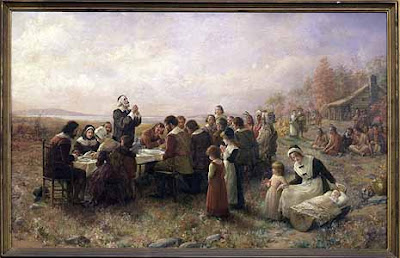 Historically, Thanksgiving had roots in religious and cultural tradition, but nowadays Thanksgiving is primarily celebrated as a secular holiday. This to be celebrated on Thursday, November 26. As a federal and popular holiday in the U.S., Thanksgiving is one of the major holidays of the year. Together with Christmas and the New Year, Thanksgiving is now a part of the broader holiday season. The people who comprised the Plymouth Colony were a group of English Protestants who wanted to break away from the Church of England. These ‘separatists’ initially moved to Holland and after 12 years of financial problems, they received funding from English merchants to sail across the Atlantic to settle in a ‘New World.' A ship carrying 101 men, women, and children spent 66 days traveling the Atlantic Ocean, intending to land where New York City is now located. Due to the windy conditions, the group had to cut their trip short and settle at what is now called Cape Cod. As the Puritans prepared for winter, they gathered anything they could find, including Wampanoag supplies. One day, Samoset, a leader of the Abenaki, and Tisquantum (better known as Squanto) visited the settlers. Squanto was a Wampanoag who had experience with other settlers and knew English. Squanto helped the settlers grow corn and use fish to fertilize their fields. After several meetings, a formal agreement was made between the settlers and the native people and they joined together to protect each other from other tribes in March of 1621. One autumn day, four settlers were sent to hunt for food for a harvest celebration. The Wampanoag heard gunshots and alerted their leader, Massasoit, who thought the English might be preparing for war. Massasoit visited the 53 strong English settlement with 90 of his men to see if the war rumour was true. Soon after their visit, the Native Americans realized that the English were only hunting for the harvest celebration. 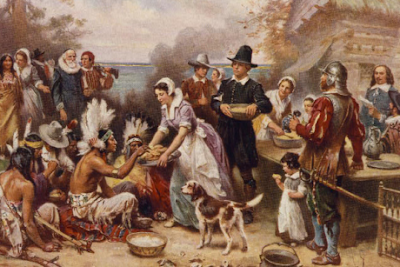 Massasoit sent some of his own men to hunt deer for the feast, and for three days, the English and native men, women, and children ate together. They also played ball games, sang, and danced. The feast consisted of fish (cod, eels, and bass) and shellfish (clams, lobster, and mussels), wild fowl (ducks, geese, swans, and turkey), venison, berries and fruit, vegetables (peas, pumpkin, beetroot and possibly, wild or cultivated onion), harvest grains (barley and wheat), and the 'Three Sisters' - beans, dried Indian maize or corn, and squash. Clearly this meal was far from today's traditional Thanksgiving feast as much of what most modern Americans ate on Thanksgiving was not available in 1621. 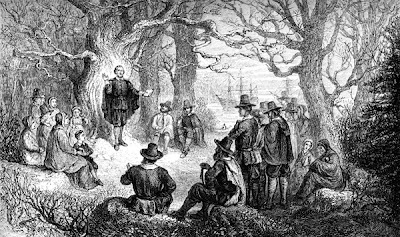 Considering the strong English roots of the early settlers, it is no surprise that the Thanksgiving holiday's history in North America is rooted in English traditions dating from the Protestant Reformation. It also has aspects of a harvest festival, even though the harvest in New England occurs well before the late-November date of the holiday. 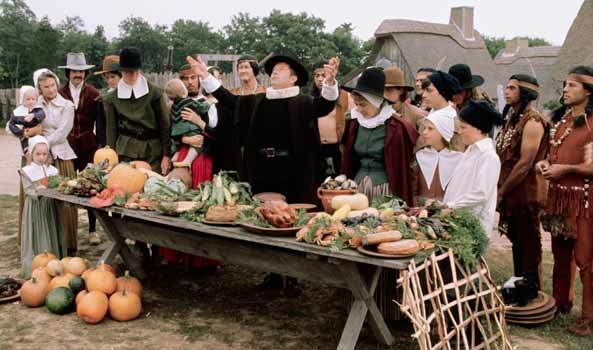 In the English tradition, days of thanksgiving and special thanksgiving religious services became important during the English Reformation in the reign of Henry VIII and in reaction to the large number of religious holidays on the Catholic calendar. Before 1536 there were 95 Church holidays, plus 52 Sundays, when people were required to attend church and forego work and sometimes pay for expensive celebrations. The 1536 reforms reduced the number of Church holidays to 27, but some Puritans, the radical reformers of their age, wished to completely eliminate all Church holidays, including Christmas and Easter. The holidays were to be replaced by specially called Days of Fasting or Days of Thanksgiving, in response to events that the Puritans viewed as acts of special providence. Unexpected disasters or threats of judgement from on high called for Days of Fasting. Special blessings, viewed as coming from God, called for Days of Thanksgiving. For example, Days of Fasting were called on account of drought in 1611, floods in 1613, and plague in 1604 and 1622. 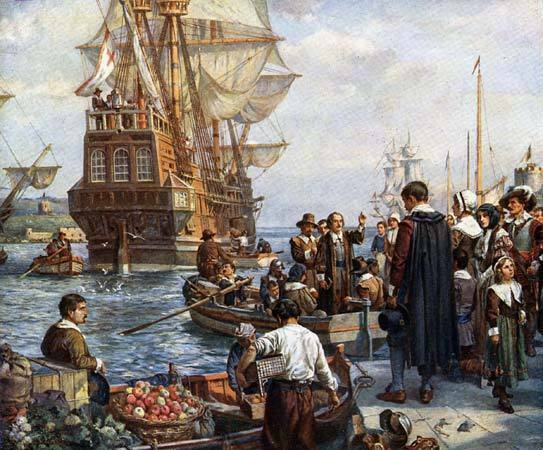 Days of Thanksgiving were called following the victory over the Spanish Armada in 1588, and following the deliverance of Queen Anne in 1705. An unusual annual Day of Thanksgiving began in 1606 following the failure of the Gunpowder Plot in 1605, and developed into Guy Fawkes Day.